WMX MX1 Season Review - race | Yamaha Motor Co., Ltd. Introducing the MX1 Class 2010 season. Yamaha, which had a brilliant year in 2009 winning the both the rider and manufacturer championship titles in MX1, was this year bidding to achieve the record of a third straight title. 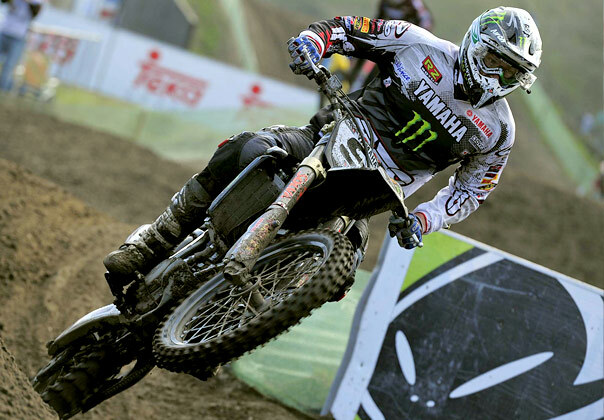 However, with the Yamaha ace David Philippaerts held to third place in the season ranking, Yamaha had to concede the difficulty of maintaining straight titles. Nevertheless, the insights won from the hard battle with his rivals and from his recovery after the repeated accidents of the first half-season will certainly serve well as Yamaha bids to recapture the title next year. Since the start of the 21st century, Yamaha has shown consistent strength in the Motocross World Championships MX1 class. 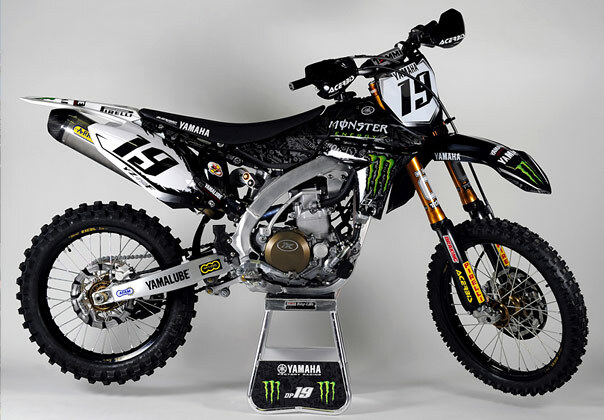 Recent memorable examples have been David Philippaerts (Yamaha Monster Energy Motocross Team) in 2008 and Antonio Cairoli (now with KTM) in 2009, but Yamaha's ability is demonstrated by the fact that it produced numerous champions in this class even before that. In the 2010 season, bidding for its second run of three straight wins in the premier class this century, Yamaha deployed the new YZ450F sporting the innovative layout of forward-mounted straight induction and a rear-slanted cylinder and with the first fuel injection system on a Yamaha motocrosser. Competing in the MX1 contest this year for Yamaha were again Philippaerts, who was aiming for a third straight championship title for Yamaha while recapturing his own title riding a modified YZ450FM based on the above design, and Ken De Dycker (YZ450F), who joined the Yamaha Monster Energy Ricci Motocross Team this year. However, their many rivals were also in good form this year, not least Cairoli. It looked set to be a season for hard-fought survival in which the tightly matched competition meant that a single mistake could bring a major upset in the ranking. As predicted, from the start of the season mistakes began to sort the would-be champions into winners and losers, with the Yamaha riders particularly affected by a series of minor mishaps. Philippaerts got off to a good start in the opening round at the Bulgarian Grand Prix, finishing second place in the first heat but then crashing in the second heat and ending up seventh for an overall fourth place. In the second round, the Italian GP, Philippaerts made a fast start in the first heat and demonstrated his own and the YZ450FM's speed by leading the field, only to damage his silencer in a crash and end up 19th. In the second heat, he came second, but had to settle for eighth overall. In the third round, the Netherlands GP, Philippaerts was third overall for his first podium finish of the year. He seemed at last to have found his form, but in the fourth round in Portugal he tumbled in the first heat to finish third, then injured his left arm in a crash in the second heat. As a result, he finished eighth to come fifth overall. Meanwhile, De Dycker showed consistent form up to the third round, finishing sixth, fourth and sixth overall, but in the first heat of the fourth round, he fell and had to retire from the race. Although he gave a strong performance in the second heat and came in third, having to retire in the first heat impacted his result and he ended in tenth place overall. In each of the four rounds since the season opener, one of the Yamaha team had had a fall. Particularly Philippaerts's crashes in three of the rounds and the resulting injury was a factor costing him precious points. Meanwhile, in the KTM team, Yamaha's greatest rivals, Cairoli had collected 179 points from three overall first places and was well in the lead. Max Nagl (KTM) was in second place with 161 points. At the start of a crucial season, Philippaerts had let Cairoli open up a lead of 46 points and was trailing badly. For Philippaerts, who had had a disappointing start to the season, resolving the problem of inconsistency was a major issue if he was to make a comeback in the mid-season rounds. The chance to do this came straight away in the fifth round, the Spanish Grand Prix. Philippaerts turned in a top-class performance in both heats to finish second overall for his second podium finish of the season. With this he seemed to have seized the opportunity to reverse his fortunes. But in the sixth round, a US GP held for the first time this century, he was plagued with crashes and other mishaps and ended up 15th, so that he dropped to fourth in the ranking and the situation once again looked gloomy for his title chances. In the seventh round, the French GP, he turned these bitter setbacks around in what amounted to a miraculous recovery, winning a third place and a first place to take first place overall. At the same time, he put down an important milestone for the new YZ450FM, which won first place for the first time. 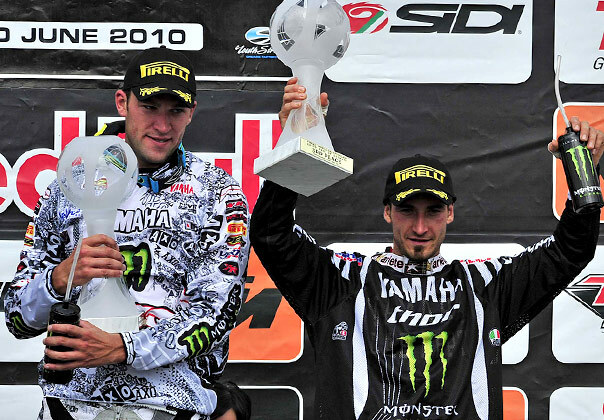 For Philippaerts, in the fourth year of his career with Yamaha, it was the first top placing since the British GP round (round seven) of the 2009 season. 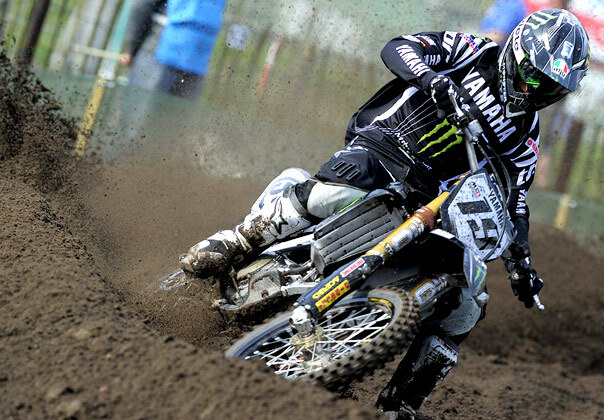 This brought him back up to third in the ranking, seven points behind Clement Desalle (Suzuki) in second place. Round eight, the German GP, also produced an outstanding result for Yamaha. De Dycker was victorious in both heats, bringing Yamaha and the Yamaha Monster Energy Ricci Motocross Team first place in the premier class for the first time. Philippaerts stood on the winners' podium for the second round in a row, having finished third overall. After that, Philippaerts managed sixth place and fifth place overall in round nine, the Latvia GP and round ten, the Swedish GP. He succeeded thereby in stepping off the roller coaster of ups and downs he had been on since the start of the season. However, far from being knocked off balance, his rivals showed an ever firmer grip. In this mid-season period, Cairoli again achieved two overall first places, racking up 434 points and establishing a dominant position at the top of the ranking. Meanwhile, Desalle, number two in the ranking, had five consecutive podium finishes from the sixth round on and widened his lead over Philippaerts to 36 points. After his first place in the eighth round, De Dycker had a change of fortune; in the ninth round, he injured his back in Saturday's qualifying, resulting in an overall 12th place. Moreover at the Swedish GP (round ten), he met with an accident in Saturday's free practice, taking a tumble and injuring his right elbow. This would cause him to miss the final, so that he fell back in the ranking from sixth place to seventh. 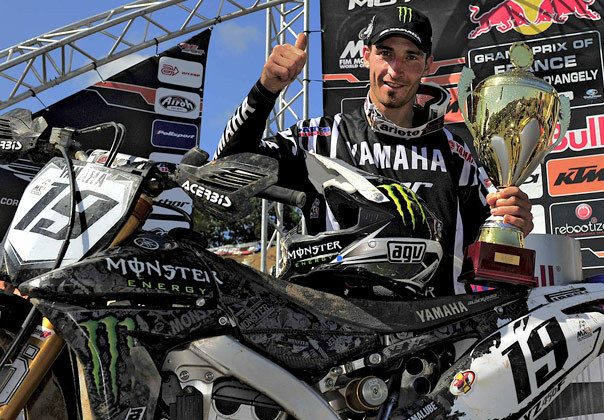 Philippaerts was left with five rounds in which to defend Yamaha season title and recapture his own. With Cairoli's lead exceeding 100 points, the situation was critical, but Philippaerts fought his way through the last five rounds on full throttle. In the first of these contests, the Belgian Grand Prix, his results over the last two years had been mediocre with an overall tenth and an overall ninth position. This time he broke the jinx to come fourth overall. In the 12th round, the Czech GP, he finished in sixth place overall, and in the following Brazilian GP, he put on a fiery display. Having achieved pole position, Philippaerts took the first heat and came second in the second for an overall second place, his fifth podium finish of the season. However, that was as far as Philippaerts was able to get. Cairoli, whose winning form showed no letup even as the season entered its final rounds, clinched the championship in the 13th round. In the remaining two rounds, Philippaerts made a challenge to Desalle, who was 30 points ahead, but the main focus was his rearguard action against Nagl, who had closed the gap to19 points. In the 14th round, the Netherlands GP, Philippaerts ended up fifth overall while Nagl took second place, narrowing the gap between them to ten points. In the last round, the Italian GP, Philippaerts came seventh in the first heat, but injured his knee in the second heat and had to fight on through the pain, finishing in sixth place to end the season holding on at third place in the ranking. De Dycker entered the 11th round with a lingering injury but took sixth place overall. Then he took 14th place overall in the 12th round, and missed out on the 13th round to concentrate on treatment and rehabilitation. In the following Netherlands GP he made a comeback. Due to the impact of having to retire from the second heat, however, he ended up 12th overall. In the final round, he retired from the second heat to finish 18th overall, thus ending the season ranked eighth. Philippaerts and De Dycker, riding new machines this season, had six podium finishes in the fifteen rounds, including two overall first places, and came third in the manufacturer ranking after KTM and Suzuki. Cairoli, meanwhile, displayed consistency and speed, achieving his second straight championship win following 2009, to stand head and shoulders above the many top riders contesting the MX1. For Yamaha, which achieved two consecutive championship titles in 2008 and 2009, this season's result was not without frustration. However, as shown by the recovery in the second half of the season, Yamaha has certainly managed to steadily gather from among the disappointments a large amount of information and experience. This is evident in maturation of the new machine's performance and how riders were adapting to it. This should serve to ignite activity and hopefully drive the team forward toward recapturing the title in 2011.